The lithe redhead captivated the audience with her dancing. They liked her beauty charm and grace. Yet they found her melancholy. Jane Avril had good reason to be melancholy. She had had to overcome great odds to achieve her dream of becoming a successful dancer. She had had very inauspicious beginnings. Born in 1848, Avril was the daughter of La Belle Elise, a society girl, and Count Luigi di Font, a nobleman. Her father was mostly absent and her alcoholic mother beat her and even wanted her to be a prostitute. Unsurprisingly, Avril ran away from home. She was picked up by the police who thought that she was insane and placed her in Paris's famous Salpatriere Hospital. Here she was put into the care of the nuns and Charcot, the expert on women's 'hysteria'. She became a rider at the Hippodrome and a cashier at the World's Fair but she really wanted to dance. Eventually she became a dancer at the Moulin-Rouge and then the Jardin de Paris. 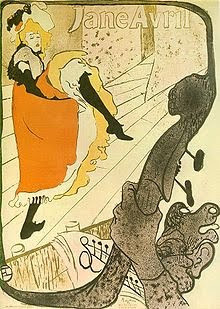 The artist, Toulouse-Lautrec, identified with the young woman's sadness and used her as his model for many posters. They became good friends and shared a love of intellectual society. Avril was cultured and liked to mix with great writers such as Paul Verlaine. There is even speculation that Lautrec fell in love with the slim redhead. In 1895 Avril seized her chance. She was offered a lot of money to replace Louise Weber, who was retiring. She accepted and became a lead dancer at the Moulin-Rouge. She even toured London. In 1910 at the age of 42 Avril married the journalist, Maurice Blais. He was unfaithful and didn't have much money. After he died she was penniless and died in a nursing home. 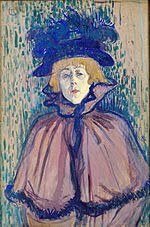 Toulouse-Lautrec's art has made Jane Avril, with her sad look, her grace, and her flaming red hair, immortal. I was delighted to find this site devoted to Jane by Craig: Jane Avril of the Moulin Rouge Here you will find a detailed biography and interesting links. Since we last met I've walked around the Golden Mount in Bangkok, been lost in beautiful San Gimignano, lamented being snowed in in Venice, and had a sleepless night on a train from Venice to Paris. I apologise for being away for so long but I had a lovely holiday. I hope to write about Jane Avril, the famous singer of the Cafe Concerts soon.